Examination of the fungal blot that spreads through dreams in an article about the Great Old One Xhamen-Dor, by James Jacobs. "What Grows Within" is sanctioned for use in Pathfinder Society Organized Play. The rules for running this Adventure Path and Chronicle sheet are available as a free download (723 kb zip/PDF). What Grows Within gets off to a strong start, with good background and intro from John Compton. The journey through the Parchlands is very atmospheric, setting the tone for what is to come, and communicating a feeling of isolation. The rivalry between the Ash Giants and the Girtablilu is well done, though derivative of Feast of Dust. 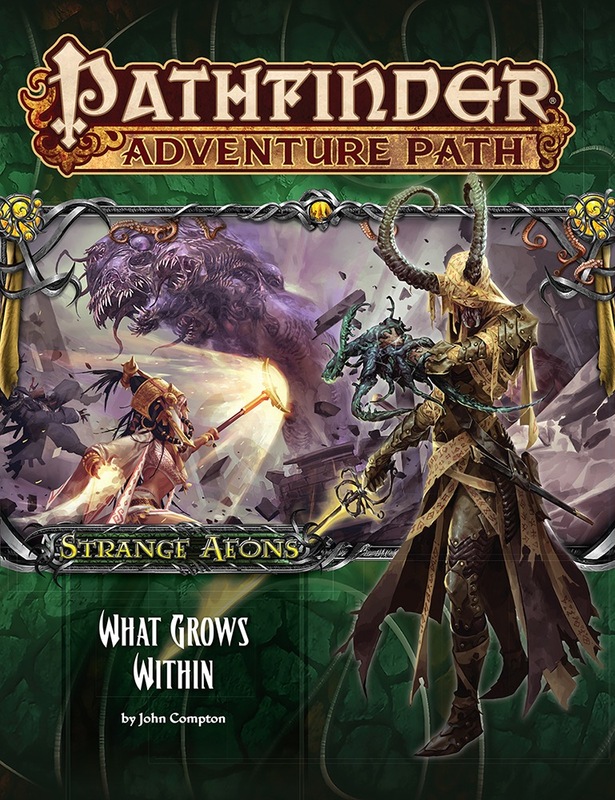 Additional strengths: Evocative primary NPCs, with fleshed out backstories, excellent articles on Xhamen-Dor, its cult, and the Necronomicon, and a nice Pathfinder Journal entry. - There are far too many denizens and happenings occurring in a supposedly "lost city", with even an otyugh merchant retailer to assist the characters with their magical marketplace needs (ugh). - The politically-correct gender activism so rampant with Paizo is ramped up here, with attempts to break stereotypes by only having females NPCs as aggressive warrior types with ridiculous STR (20-25) ,breaking verisimilitude and inducing copious amounts of eye-rolling. - There is far too much reliance on "haunts" to illustrate for the PCs exactly what Lowls did and the route he took. Lazy, lazy, lazy. - Calling the excsinder archons LG is an odd choice, considering they care not for individuals' lives. That's analogous to saying that those in the real world who are concerned with winning a war for a just cause, but do not care how many civilians die, are somehow good. This is wrong. - Apparently /flying/ alien polyps, when they build a city, make sure to include convenient human-sized stairs to access all the relevant rooms, despite much of the rest of the tower not conforming to standard geometry/physics. Good times were had. Could be better, but I have played a whole lot worse. In role playing games, railroading is when the players are forced into a specific set of actions regardless of their wishes. This chapter of the adventure path does this in the worst way possible. The plot goes as follows: The big bad has used an evil book to perform a ritual to enter the realm of Hastur, an evil demigod who looks like some guy in a yellow hood. The players must save the day and prove their heroism by....reclaiming the aforementioned evil book and performing the same evil ritual to enter the evil demigod's home realm. Sigh. The book is located in yet another ruined city filled with monsters who sit around waiting to be attacked. Seriously, is it possible to go half a block without stumbling into a ruined city in gaming? In the course of the adventure, the players will be forced to kill no less than two angels who are simply doing their jobs. (Three if you count that guru-angel turned emo). The book explicitly states that it is impossible to avoid killing the angels, without making a deal with a devil and even that only reduces the death toll to one. Not exactly friendly to players who play paladins and clerics. Making matters worse is the fact that there is no real reason to do any of the adventure. No reason is given for why the players cannot simply use common dimensional travel magic to reach their goal. For that matter, what exactly is the threat that bad guy possesses? The text indicates that he may elevate his patron from demigod to outer god, but it never stated how this to take place and what its significance is. Hastur is already featured as a challenge rating 29 entry in the Beastiary 4 and seems to have no difficulty interacting with the mortal world. The rest of the book is given over to discussing the evil book, but honestly, Paizo has already gone over similar ground in earlier projects and much more competently. Also, there is an overview of the Great Old One Xamen-Dor, but it is just another evil demigod who uses fungus to create undead. This setting already has about a half dozen bad guys who do the same thing and honestly, it is kitchen mold. How scary can it be? The villain has some other gimmick about becoming more powerful the more people know of it, but this never really plays much a role. My review is based on a copy where pages 1-16 are missing/replaced by copies of pages 17-32, so i can obviously not consider them in my rating. I already read that the map of the city on page 14 is missing a scale (it´s supposed to be 400 feet for the scale bar) and that how exactly the characters got through the Parchlands of Casmaron (which don´t get a map) to this place is pretty much handwaved, but the rest (pages 17-96 plus two inside covers) are conclusive enough for me. As i will give my copy back to the store tomorrow and probably receive a mint one in as early as 2 months time, i write this review before the one for AP#112, which i havn´t read entirely yet. The inside front cover illustration of the city and inside back cover illu of a flying polyp are very atmospheric. All of the artwork is very good. Every battle-map but one is easy to draw, yet fun to play on. The encountered creatures are very diverse and a lot from Bestiary 5 or new ones are included. There is a dark and moody atmosphere permeating the adventure and reading the handout on page 25 actually made me shiver. A lot of the encountered creatures can be parleyed with (if done rightly), some have to be killed - a perfect mix with plenty of roleplay possibilities. The challenge rating is just about perfect. A lot of new horrific haunts are in here. All 5 Bestiary entries are great, especially the Child of Yog-Sothoth template and the Hunting Horror. The map of "the snarl" on page 31 is not easy to draw and also doesn´t fit on a "Bigger Flip-Mat", something i have come to loathe as a GM. 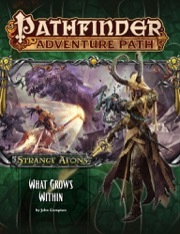 There are at least 3 different gargantuan creatures encountered in this adventure, yet none of which can be presented by any gargantuan miniature, neither from "Pathfinder Battles" nor "D&D". This adventure gives me an "H.P. Lovecraft´s The Nameless City" vibe, which is a great accomplishment. Often book 5 of an AP is so ridiculous overcomplicated to run, that i immedeately decide not to. Not with this one. So far the "Strange Aeons" AP is one of the rare ones (if not the only one), that doesn´t have a disappointing book in it! The next continent Pathfinder needs to explore is Casmaron and with the excellent Pathfinder Campaign Setting: Qadira, Jewel of the East, another step in this direction is done (the first being the map of it´s nortmost part "Iobaria" in Pathfinder Adventure Path #33: The Varnhold Vanishing (Kingmaker 3 of 6) - the only part of this AP of which (non-mint) copies are still available. Announced! Cover image and description are not necessarily final. So where does this one take place? The parchlands are a part of Casmaron. This sounds and looks like an instant Classic! So hyped! I wish my Bloodborne-Lovecraftian campaign was delayed by 5 months so I could shamelessly rip from what is looking to be utterly fantastic work. Awesome! I really love the new products. Great old one sleeping? Hmm... I wonder which one? Xhamen Dor, probably. It slumbers by a lake, doesn't it? It is also featured in an article in this very book. Where Xhamen-Dor’s comet came to rest is unknown—but its cult agrees that the fallen star that bears the Great Old One’s core lies at the depths of a large but remote lake somewhere in the world. Ah yes. Good catch. I wouldn't be surprised if that is the lake the abandoned city lies on. This AP feels like it's going to be everything I ever dreamed it could be. YAY! I can't wait to read that article about the Necronomicon. Doy! This is what happens when you are half asleep when posting. Also, for some reason I was thinking Xhamen-Dor was the guy in the mountain next to Xin-Shalast, but I now remember that is Mahr. Mahr is the mountain. Xhamen-Dor is in the lake. I'm pretty sure Cthulhu is in R'lyth having a good snooze. Brilliant cover image. Who's the guy on the front? He's wielding the favored weapon of the King in Yellow, so he's probably tightly associated with the Unspeakable One. That blot on his arm is likely a mote of Xhamen-Dor, givne the adventure's association with that being. I don't remember seeing any horns on denizens of leng. But he could have a template or even class feature for that anyway. The dangling tentacles alone fill me with glee every time a new final cover is announced! So we have motes nows? Not Moits? Well that explains the turbans then. My knee jerk reaction to the old god in the lake was Glaaki. But after reading about Xhamen-Dor I have to go with him. You'll find out soon enough who she is! I find that cover all kinds of disturbing. Love it! I thought something like that might be the case. You can really see it in her abdomen. Look at the curve of her back, and the part of her body behind the rightmost tentacle. It's not as easy to tell. At least for me. But then again, I couldn't tell the difference between a moth and a butterfly. Infested by Xhamen-Dor isn't something I'd recommend for weight loss though. As he is strongly tied to this AP, and specially to this volumes, as it contains details about him, is it safe to suppose that Xhamen-Dor is the Great Old One among the monsters in the bestiary article? I enjoy providing numbers. Numbers give players the hope that, in the horrible event they do awaken a Great Old One, they stand some chance. Sometimes numbers start with a plus sign and are divisible by 43. Sometimes players regret their actions. Sometimes the GM gets to use the really big stat blocks. Perhaps that's relevant to this adventure and/or its backmatter—not my place to say just yet. I think we'll have to wait until subscribers start getting their copies. The final adventure (Black Stars Beckon) only has a single support article, and that's the Continuing the Campaign one. It stands to reason that its Bestiary could also be a few pages longer to accommodate additional GOOs. We don't have a final description of Black Stars Beckon, but right now it also includes "a history of Golarion." I remember reading somewhere that James Jacobs said that the "History of Golarion" article got cut, but that could have changed. Also i don´t think we get more than one GOO per Bestiary, because all the other ones by HPL or Paizo can still be in Bestiary 6 or 7 or inserted when needed. Xhamen-Dor could be in the NPC Gallery or the adventure itself OR in the Bestiary of book 5, but book 6 will most likely only have Chaugnar Faugn. The history article did indeed get cut. It wasn't the right place to do an article like that, honestly, and the Continuing the Campaign article has some good stuff that we got to get into as a result of having more room. There's only one Great Old One in this one, like all the rest. So that makes it clear that we´ll get Xhamen-Dor, the Inmost Blot as Great Old One in this issue. Chaugnar-Faugn isn't out of question, but he was illustrated in the first book of the AP. If I'm not mistaken, it was said that "not getting an illustration" was a hint about the Great Old Ones that would be stated in the AP. So, while I'm not sure if this is still a thing, I'm guessing that the last Great Old One to be stated will be either Ghatanothoa or Orgesh. I'm new to subscriptions and saw that this book dropped off the radar on my Subscriptions page, January isn't in the upcoming section and book 5 isn't the most recent or next at the bottom. Not really worried but just curious if this is normal and what people know about why it happens? Loving the AP by the way!